I’ve been making designs for a squat rack with pull up bar. Not a full power cage, so no spotter bars inside, because I want to use up as little floor space of garage as possible. It’s quite simple in its design, I hope the pictures speak for themselves. The beams are all 5cm x 10cm (2”x4”). 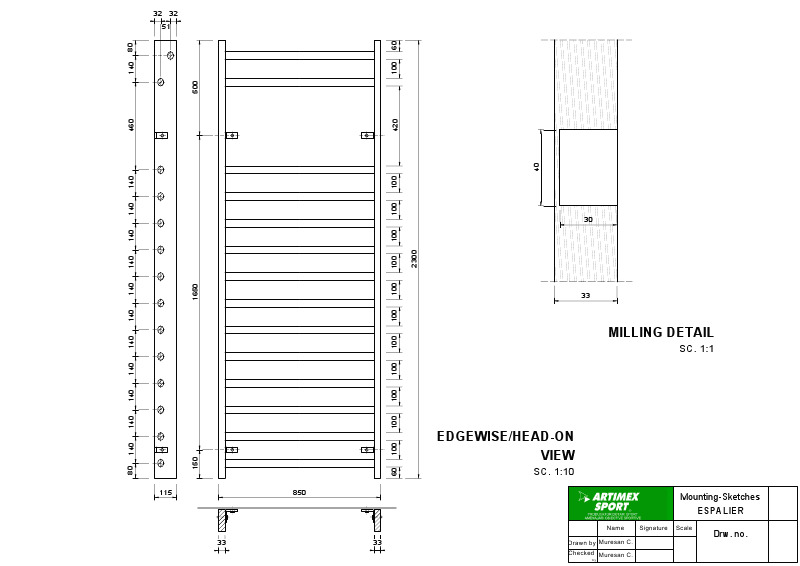 The bar will be at least 235cm (7 ft. 8” ) from floor (I could add a couple of inches vertically to have the bar at 8 feet, depends on the length of the beams I'll buy) and 65cm (26”) from wall. I’m 183 cm (6 ft.) tall. I also plan on making my own J-hooks. I’ll drill 16mm holes in the beams every 8cm at 134, 142, 150 and 158cm. The J-hooks are made of 4 pieces of 14cm x 5cm x 10cm (5,5” x 2” x 4”) with a 16mm hole, but off-center. Two pieces will have the hole 1cm off center, resulting in 6cm and 8cm from middle of hole to edge (red one). The two other pieces will have the hole 3cm off center, resulting in 4cm and 10cm from middle of hole to edge (blue one). The top and bottom are slighty skewed (1cm) to allow the bar to rest on het J-hooks without rolling off. A 16cm bolt will hold the J-hook to the rack (I don’t imagine changing the height that often as I’m the main user), and a piece of scrap ¾” plywood will prevent the J-hook from turning. By doing so, I can have 2cm intervals on my J-hooks with only 8cm between the holes, ranging from 138cm to 168cm. (I could add a hole at 126cm from floor, so I can have J-hooks from 130cm up.) Say I want the bar at 156cm from floor, then I put the 6cm-8cm J-hook with the 6cm side on top in the 150cm hole. If I want 160cm from floor, same hole, but with the 4cm-10cm on it with the 10cm side up. Hope it makes sense. 2. Do you have suggestions for improvements? No idea about strength. I had built my own wooden power rack. It worked like a champ - had up to 365# in it for working sets and it didn't even budge. I could do pullups in it too (weight 100-110kg). I also loaded it (and the safety rails) with 500 or so pounds, then added me and it was as strong as a house. I used that method and it was solid. Felt very comfortable using it. I watched a bunch of these videos to get various ideas - because they're always something that is mentioned "wish I did this". I am not an engineer, but I would suggest using 4x4 posts instead of the doubled up 2x4s for the uprights. Also I don't like the idea of drilling holes for the j-hooks right on the seam of the two 2x4. Over time I can see the j-hooks acting as a wedge causing the 2x4s to split apart. This issue would be eliminated with a 4x4 post. Thanks Clint, great vid indeed. Good remark James, thanks. It just seemed easier that way to make the cut-out for the transverse beam on top, but it has a distinct weakness for sure. I'll see if I can find some good 10 by 10's. If not, I could always turn them 90°, as showed in the vid Clint posted, and adjust my cutting. This is my opinion, for the cost of the lumber to make the rack, you might as well save up a little and buy a metal rack that will last you till you die, and will be less likely to kill you. I'm all for DIY, but loading up a wooden rack with over 400# or kipping pullups scares me. Especially since you can get a rack for relatively cheap. I love DIY gym equipment. - Triangular supports at the top will reduce wobble in the system. - Side supports to back wall will really increase the strength. I second this. Do not put your load-bearing holes on a seam. Also, a pull-up bar should have 1 and 1/4" outer diameter. I used a 1" black galvanized pipe from Home Depot, and it has a 1 and 1/4" outer diameter. It's ever so slightly larger than a barbell diameter. I think 3/4" would feel too small in your hands. Your pull-up bar doesn't have to be extended forward of the vertical support. This creates a cantilever force (the weight of hanging on the pull-up bar will want to lift the top attachment up off the wall). If you put the pull-up bar right through the vertical support it will be stronger. I built a DIY squat rack / pull-up system for my home gym. Because of the wife and kids I wanted more than one pull-up station, though I couldn't figure out a way to do more than one squat station due to the space I had. The 4x4s are anchored top (into ceiling joists) and bottom (into concrete). I used these U-brackets from Home Depot to anchor the bottom (wfs). I bought J-cups and safety bars from Rogue. The video Clint posted is pretty awesome. I didn't consider a DIY J-cup, though that looks like a good option. The size I bought from Rogue is from their Monster series. They come with flat plastic inside. I removed the inside plastic and they are the perfect size to fit around the 4x4. The holes I drilled in the 4X4 are reinforced with a 1" pipe. The Monster pin is 31/32" and fits beautifully inside the pipe. The Rogue W-4 has a similar design and costs $565. I would guess the materials for this DIY version would be about 40% that or less. He'll save a significant amount. I didn't consider buying J-cups as I thought (wrongly) they would not be compatible with a DIY squat rack. I'll ask the box where I go for Oly classes twice a month for the contact details of their supplier, CrossGym, and see if they have similar J-cups that would fit, and then add it to their next order to save on shipping. I already found good 4-by-4's, so the problem of the seam is eliminated. The reason I extended the pull-up bar is to have sufficient distance from the wall if (!) I ever achieve doing kipping pull-ups. On a scale of 0 to 10, 0 being novice and 10 being competitive CF-athlete, how would you rate kipping pull-ups? Just to adapt my expectations on that level, and my designs. I could add diagonal braces in the two corners of the T on top, to transfer the forces on the vertical bars and thus on the other connectors to the wall. But ... there is a twist in my plans so I might have to redesign. My GF and her two daughters are very much into gymnastics, and they want stall bars in the garage. I've been looking up the stuff you can do on it Mobility-wise and it's quite amazing, so I like the idea, and I found schematics here. I would add a metal pull-up bar on top, slightly extended (see question on kipping pull-ups), but I do not want to give up on the squat rack, so I'm looking to combine both. However, if I were to put J-cups like on a regular squat rack, the dowels would not allow me to get under the bar. I would therefore need more distance between the J-cups and the dowels. (1) has anyone seen such a combo yet? (3) how could I achieve this? My first thought is to make wooden safety bars say 30cm long (depends on the answer on question 2) with a 1" metal pipe inside the total length that then slides into the vertical 4x4, and with a diagonal brace to eliminate the cantilever force and torque. I could also make the dowels retractable, and slide them sideways when I want to squat, and slide them back when using the dowels? But perhaps one of you has a better idea? I would rate kipping pull-ups as a 3 out of 10. It's something you'll learn fairly early in the progression of skills, though not a super important skill. I would recommend you be able to do 5 or more unbroken deadhang pull-ups before you go to kipping. I've never seen a combo stall bar / squat rack, as the worlds of gymnasts and weightlifters are not often this close. It's an interesting idea. What you're describing sounds like you'd put the stall bars in the same vertical as the squat rack. I wouldn't do it that way unless you're okay taking the time to switch things out a lot. Stall bars only need to be a couple inches from the wall - enough for fingers to grip inside the bar, or for a toe to hook inside the bar. I would recommend building your stall bars close to the wall, and having your squat verticals away from the wall. A lot of CrossFit gyms have a wall mounted pull-up/squat rig with wall ball stations inside the rig. Think of your rig as having a squat/pull-up station a few feet from the wall, with the stall bars inside the rig, close to the wall, in place of a wall ball station. This design however, will double the number of 4x4 verticals you'll need. The space to get under the bar would be less relevant than the space needed when using the stall bars with this design idea. If you separate the stall bars and the squat rack, your girlfriend and daughters could be doing their thing 5 seconds after you're done squatting, or maybe even at the same time. I didn't consider buying J-cups as I thought (wrongly) they would not be compatible with a DIY squat rack. I'll ask the box where I go for Oly classes twice a month for the contact details of their supplier, CrossGym, and see if they have similar J-cups that would fit, and then add it to their next order to save on shipping. My home gym rig has two different sizes of hardware from Rogue: the J-cups are from their Monster system and the safety bars are from their Infinity series. The Infinity size pin doesn't have a corresponding standard metal pipe size to fit it. The Monster pin fits perfectly inside a 1" pipe. Also, the metal sleeve I used was longer than the 4x4 was thick, so it stuck out in back. I used a hack saw to cut off the excess pipe once it was in place. Otherwise the excess pipe got in the way of the J-cup rotating down into position.